Psychics versus aliens with Earth’s future at stake—and love will determine the victor. 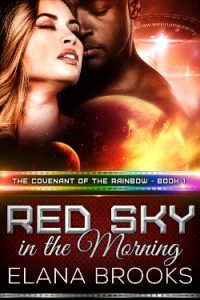 Adrian Marshall is a recruiter for the Covenant of the Rainbow—a millennia-old secret society dedicated to defending Earth against hostile aliens. He runs covert screening sessions, seeking people with psychic abilities. They’ll be trained to use their gifts of telepathy, telekinesis, and astral projection to repel the coming invasion. Though his own gifts are modest, he’s deeply committed to the Covenant’s cause and determined to contribute to the best of his ability. Life has taught Beverly Jones not to believe in anything she can’t see, or to depend on anyone besides herself. When a simple exercise class takes a bizarre turn and the handsome instructor tells her she’s the most powerful psychic he’s ever discovered, she knows it’s only a dream. Why should she heed his warnings when the danger isn’t real? But when she recklessly courts death, the dream becomes a nightmare. To save her life and Earth’s best hope of salvation, Adrian links their souls in a bond breakable only by death. Trapped in a union neither of them wanted, Adrain and Beverly cautiously get acquainted. Despite their profound differences, growing attraction draws them together. If they can learn to love and trust each other, the soul bond can make both of them far more powerful than either alone. If not, it might kill them. As the alien ship approaches, Adrian and Beverly struggle to overcome the fears and prejudices that keep them apart. Only by uniting hearts and bodies as well as souls can they hope to survive and save Earth from destruction. Elana Brooks lives in Houston with her husband of 26 years. She’s been an avid reader of science fiction and fantasy since she was a child and discovered an exciting new love for romance several years ago. She spends a lot of time in Starbucks, drinking vanilla flat whites and telling stories about her imaginary friends. She enjoys dabbling in many hobbies, including spinning, knitting, weaving, costuming, hot air ballooning, singing in her church choir, and performing in amateur musicals. She also writes Young Adult Fantasy under the name Angela Holder.